Softer colors, shades of gray and a few reliable patterns are all the rage this year. Discover which colors, patterns and styles can spice up your home and add a modern touch. A soft palette of taupes and grays sets a calm mood this year and provides a background for accent colors like refreshing blues and greens. Over-sized interpretations of paisley or ikat patterns are popular (as in the sofa pillows and rug above) and touches of gold in accessories have made a comeback. Notice the coordinating, but not matching, end tables and lamps. 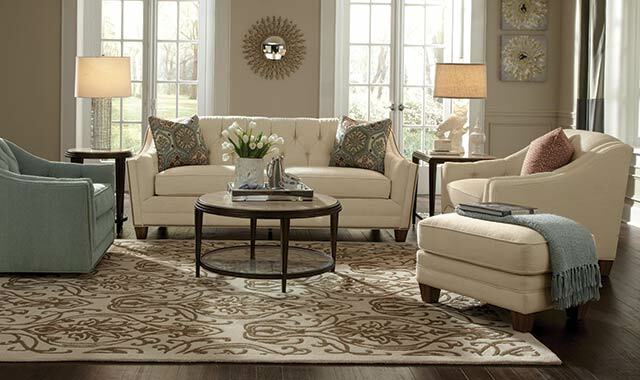 This handsome furniture grouping is by Flexsteel. Although designing a room with bold colors was especially popular last year, colors are trending to the more neutral side in the new year. “The vibrant colors are getting slightly muted with softer undertones now,” says Sheila Anderson, designer at Gustafson’s Furniture & Mattress, 808 W. Riverside Blvd., Rockford. Anderson recommends incorporating various shades of gray, from taupe to charcoal, while adding a few pops of color such as cobalt blue or navy. Popular patterns include geometric, Moroccan, ikat and tribal, sometimes in watercolor, oversized or very sophisticated interpretations. Paisleys are also a favorite in our region. Mixing colors, patterns and textures within a room can help you to express your personal style, says Anderson. She points out three key steps to consider as you work on interior designing. First, figure out a color scheme you like. Next, determine your scale. Then, pick out the design. Many of Anderson’s customers have been redecorating TV rooms lately. Especially popular with men are recliners that are not only comfortable but also functional, with built-in features like coolers and cup holders, retractable tables and USB ports, which make it easy to use a tablet or laptop in the comfort of a chair. Sometimes, however, people object to the look of bulky recliners, says Anderson. The Best Home Furnishings brand provides a compromise so that everyone in the house is satisfied. “This recliner is more of a middle ground because it’s a sleek, reclining love seat that has cup holders and consoles, but it still looks modern,” she says. Homeowners often opt for a relaxing rustic ambience in their TV rooms. Antlers and deer heads have been popular since last year, and now horse and buffalo heads are, too. They can be hung on a wall as an accent piece. If you’re looking to create an eco-friendly home, consider buying furniture made from recycled wood. From headboards and benches to dining room tables, there are numerous ways to incorporate eco-friendly or reclaimed items into your decor, whether your tastes lean toward traditional or contemporary. Anderson notes that a visit to Gustafson’s will familiarize customers with a wide array of furniture and accessory styles. “The secret here is that we have so much space, so we can carry many brands and price points,” she says. Along with pops of blue or acid green, warm, rich shades of Marsala are showing up in interior design showcases. Pantone named it the 2015 Color of the Year. “Much like the fortified wine that gives Marsala its name, this tasteful hue embodies the satisfying richness of a fulfilling meal, while its grounding red-brown roots emanate a sophisticated, natural earthiness,” says Leatrice Eisman, executive director of the Pantone Color Institute. It’s luscious on walls, textiles and accent pieces. A rustic style throughout the house is an extremely popular trend these days, according to Coleen Carlson, designer at Benson Stone Company, 1100 11th St., Rockford. Benson Stone is brimming with items to accommodate this and other looks. The whole room doesn’t have to look rustic, though. Mixing styles and textures makes the environment much more intriguing. Carlson recommends pairing reclaimed wood pieces of furniture with a buttery-soft leather sofa, for example. “The use of contrasting textures and surfaces is the greatest look out there right now,” she says. As color schemes trend toward softer hues, shades of gray, ivory and brown create a calming environment. Think driftwood when choosing accessories – something timeworn with an ivory finish. “At the same time, though, gold is making a comeback,” says Carlson. Lamps, picture frames and even accent furniture pieces offer warm glimmers of gold. Sometimes the gold shows up unexpectedly, as on rope-treatment lamps or mirrors. At Benson Stone Co., Carlson is seeing more prints with magnified patterns, such as a larger-than-life paisley or ikat. There are many ways to blend patterns and styles throughout the home in a way that makes sense for you, personally. American-made Palettes by Winesburg, for instance, offers custom dining pieces, so that customers can choose the table top, legs, finish and chairs that make sense for them. “People have different space allowances and family sizes, so it’s a neat program to have it all customized,” says Carlson. If you want to embark on the process of updating a room, Carlson recommends grabbing some magazines and going online to find inspiration. Even though there’s a steady movement toward a more casual atmosphere, homeowners still want their rooms to look well put-together. The designers at Benson Stone Co. help customers to shape unique interior designs that nurture their individual aesthetic tastes. “We’re not really doing cookie-cutter rooms where everything matches everything else,” says Carlson. This entry was posted on Friday, February 20th, 2015 at 12:00 pm	and is filed under Home & Garden, Top Posts. You can follow any responses to this entry through the RSS 2.0 feed. Both comments and pings are currently closed.